Posted August 28, 2013 by okconguest & filed under Invited Speakers, OKCon. The sixth guest post in the series of contributions by OKCon 2013 speakers is by Iulian Pogor (World Bank), Meghan Cook (University at Albany), Barbara Ubaldi (Organisation for Economic Co-operation and Development – OECD) and Ton Zijlstra (Open Knowledge Foundation). 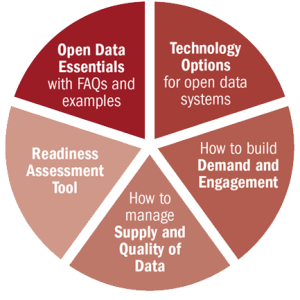 They are among the coordinators of the workshop Open Data Toolkits and Assessment Tools, which will take place, as part of the Open Development and Sustainability programme, on Tuesday 17 September from 11:30 to 13:15 @ Room 14, Floor 2. The Open Data Toolkits and Assessment Tools workshop to be held on September 17 from 11:30 to 13:15 within the Open Knowledge Conference will present some technical assistance tools and the emerging lessons from implementation of those in developing countries and discuss options for their improvement. The workshop will be broken down in two parts: (i) short presentations and discussion on the World Bank’s Open Government Data Toolkit (by Amparo Ballivian, Chair of the Bank’s Open Government Data Working Group) and the United Nations Guidelines on Open Government Data for Citizen Engagement (by Daniel Dietrich, UN Department of Economic and Social Affairs), and (ii) longer presentations and discussion on the open data readiness assessment methodologies from the World Bank and the Web Foundation (by Tim Davies, Research Coordinator), the Center for Technology in Government (by Meghan Cook, Program Director), OECD (by Barbara Ubaldi, E-Government Unit Project Leader) and Open Knowledge Foundation (by Ton Zijlstra, Independent Consultant on Change, Complexity, Knowledge Work, Learning) along with the lessons learned from their applications in developing countries. This second session will aim to gather ideas for improvements of these assessment methodologies. The Open Data Census assesses the state of open data around the world. The Census is a community-based effort initiated and coordinated by the Open Knowledge Foundation but with participation from many different groups or individuals. It collects and presents information on the evolution and current state of open data.